Carson Street is the State's only Primary Education Support School and it caters for students whose disabilities are such that they are not presently being integrated into the regular school system. All require extensive therapy and educational services. Students have a wide variety of medical conditions which are handled sensitively by the nursing staff. Our students live in the South Eastern corridor of Perth. The School is located within the Town of Victoria Park, which is considered to be inner metropolitan, residential, light industrial. Students graduate in the year they turn 13 and most then transfer to Kensington Secondary School for their senior years. The staff believe that the influence of a student’s family is extremely important to a child’s progress and achievement; therefore cooperation between home and school is important. Home-school communication books, regular newsletters and special activity days keep parents informed and involved in their child's learning program. Portfolio assessment is used and an annual report is provided to parents at the end of the year. Detailed attention is paid to individual needs. Planning, monitoring and assessment of students using Individual Education Plans and high quality teaching and learning programs result in maximising outcomes for our students. With the general movement towards inclusion, early intervention has become a priority and staff believe that they can play a valuable role in preparing many young children with disabilities for inclusive learning environments as well as providing an exemplary program for those who remain with us for their primary schooling. Early Intervention Programs, including Conductive Education are highly effective due to the expertise of our staff, the quality of the learning opportunities and the way we work with other professionals and parents. The school council is an important lobbying group and is very supportive of the school. Members lend their expertise in key areas such as curriculum, finance and advocacy. The P&C offers support to families and is the major fund raising arm of the school, leading to improvements in equipment and facilities. Carson Street School is adapting its facilities and services to the current inclusive educational climate and is ready to play a positive role in the education of students with disabilities in the future. Teaching staff are very experienced and there is a minimum of turnover each year. Each classroom also has a full-time teacher's assistant. In addition we have a satellite class at Belmay and Primary School which provides integrational opportunities for the students. A number of volunteers have a marked effect upon the student learning program. Considerable time and effort needs to be put into the volunteer program to both train new personnel and to maintain established programs. 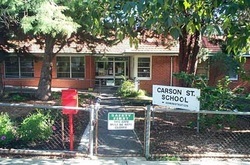 Students from nearby private schools also participate in their community experience programs by working at Carson Street for half a day per week for a term. The school has also forged a link with Curtin University volunteers.